Often called the “American Riviera,” Santa Barbara is located less than 100 miles north of Los Angeles in southern California. On the other hand, it’s also considered the southernmost part of Northern California. The reality, however, is that it incorporates the best of both Californian worlds. And they may just be right, given the fact that several Hollywood celebrities, ranging from Sir Laurence Olivier and Clark Gable to Gwyneth Paltrow and Sandra Bullock, have tied the knot here. It’s also where JFK and Jackie O. spent part of their honeymoon. The late President Ronald Reagan’s ranch (aka the “western White House”) is here and celebrities such as Oprah, Kirk Douglas, George Lucas, Carol Burnett, John Cleese, Drew Barrymore, Julia Louis-Dreyfus, Kevin Costner and others still have homes in the area. What draws so many to Santa Barbara? Make up your own mind by visiting this city nestled on the coast along California’s fabled Highway 101. You only need to view the azure sea lapping the beach, or the sea of red-roofed whitewashed buildings with their dramatic backdrop of mountains, to understand why it’s become America’s Riviera. And the resemblance is more than just seas and mountains. 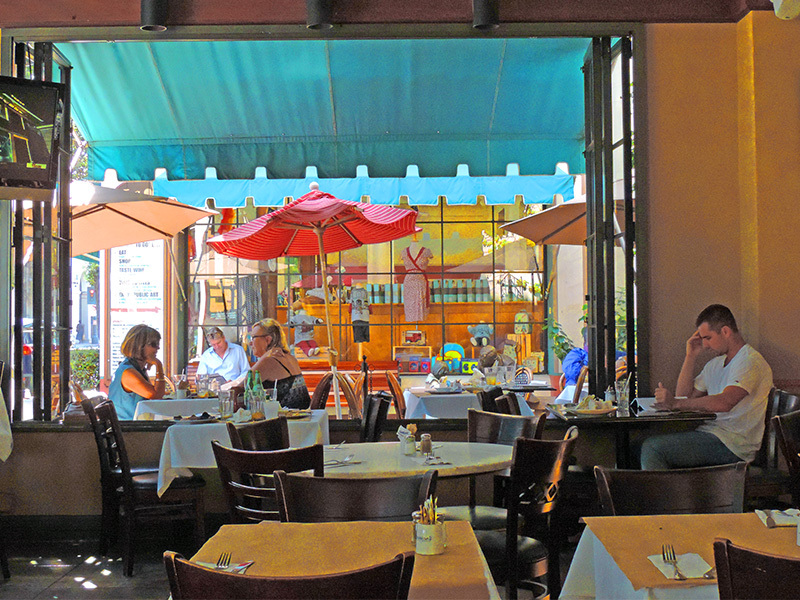 As in Cannes and Antibes, San Remo and Portofino, Santa Barbara also has legions of restaurants that wind their way down to the seaside. And charming streets where the aroma of culture wafts from a multitude of museums and galleries. Far off in the distance vineyards scurry across the foothills; closer by shoppers scurry in and out of chic boutiques and galleries peppered all over the city. It’s a coalescence of la vie est belle and la dolce vita on the shore of the Pacific. 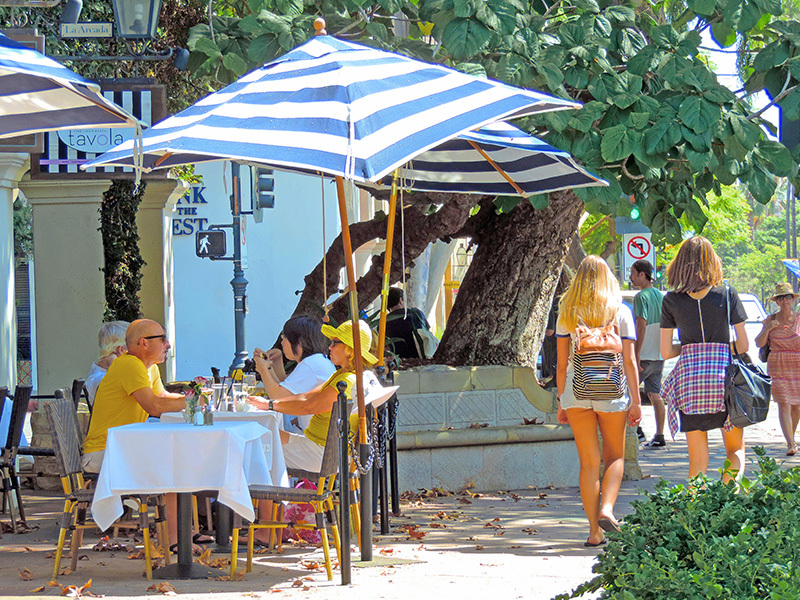 Aside from its aphrodisiacal qualities, much of city’s appeal is that Santa Barbara’s downtown is chockablock with cultural sites, historical places, great restaurants, and tasting rooms for wineries, all within easy walking distance of one another. The most popular local destinations are the Waterfront District with its iconic Stearns Wharf, and the Downtown Historic Arts District, both just a short walk apart. 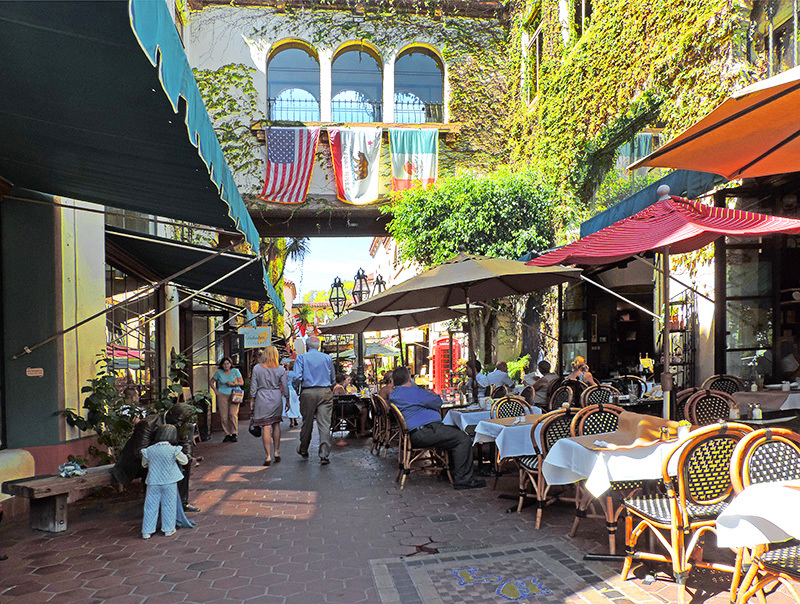 The heart of it all is State Street, lined with a multitude of cafés, shops, galleries and museums, and little paseos, with their gatherings of boutiques and cafés, that run off it. On State Street, you’ll also find the small Santa Barbara Museum of Art, home to a good American collection that includes works by O’Keefe and Hopper, as well as some works by Picasso. The city is so easily navigated that you can visit almost two-dozen historic and architectural landmarks all within a 12-block area of Santa Barbara’s downtown. This area includes the Presidio State Historic Park, a former Spanish fort dating from 1782, and the Santa Barbara County Courthouse. This court, however, is not your average courthouse. In addition to a sunken garden, the building also contains a beautiful Mural Room on the second floor with two large chandeliers hanging over the chamber. Before you visit the Mural Room take the elevator to the top of its clock tower for 360° view of the city. Out across the sea of red-tiled roofs you can see everything from the dramatic backdrop of the Santa Ynez Mountains, right out to spinnaker’s racing across Santa Barbara Channel. Take the stairs down to the mezzanine level and between the fourth and fifth floors you’ll see the clock mechanism working. 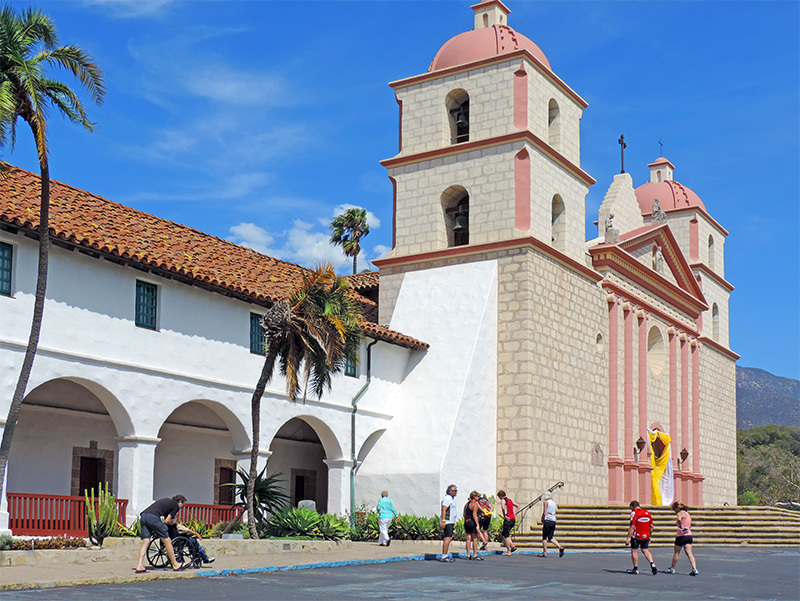 The area along this American Riviera embraces three of California’s 21 missions, including the historic Old Mission Santa Barbara. 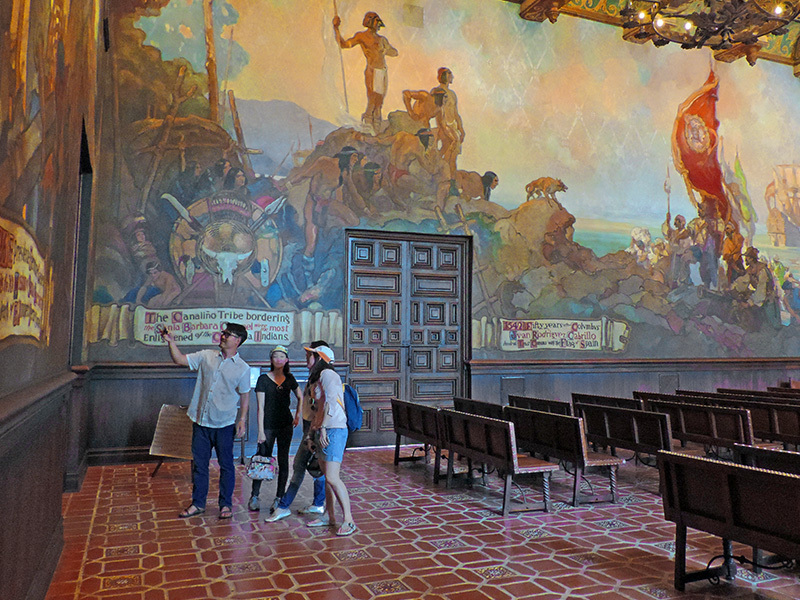 It’s the best preserved of all the California missions and the primary cultural and historic landmark in the city. Founded in 1786, it’s quite interesting from both a historical and ecclesiastical perspective. It’s well worth taking an hour or so to wander about the church, the museum, and the cemetery to get a sense of what life was like on the central coast of California during the 18th century. You’ll find the entire mission, including the church, the museum, and the gardens rather austere, much like the life of the monks who lived here. 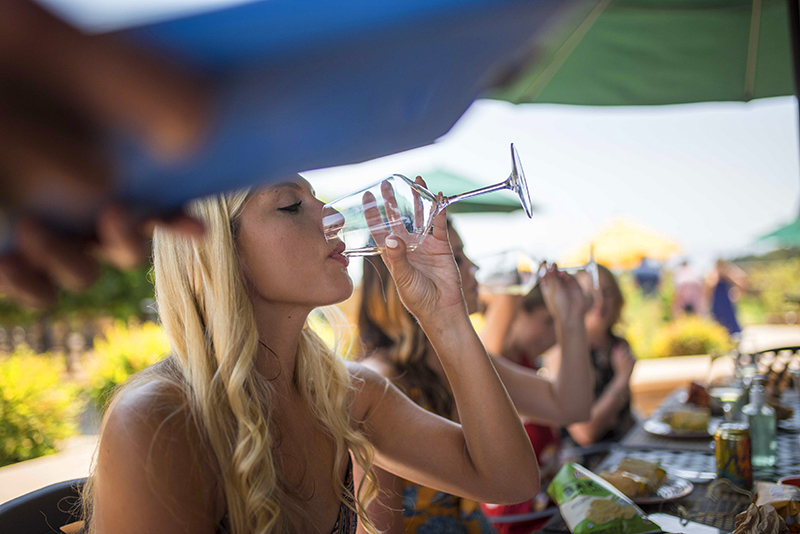 Like other wine regions further north, oenophiles find the American Riviera’s wineries a delight (as do movie-goers: SB was the setting of the “wine-infused” Oscar-winning film Sideways). It only takes about 45 minutes to reach wine country from downtown Santa Barbara, and there are more than 175 wineries and five wine trails in the area. There’s even an “Urban Wine Trail,” with 11 wine production facilities and tasting rooms right in downtown. (To see how to get to Santa Barbara and the wineries from elsewhere, see below). Don’t limit your tastings to wine, however; if you’re a beer lover, you’ll find some microbreweries scattered about town, as well. From an epicurean perspective, Santa Barbara is on steroids, nestled as it as between the ocean and vast stretches of farmland and wineries. 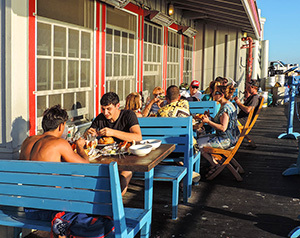 Farm-to-table and sea-to-table are important concepts here, and keep the city’s restaurants filled. 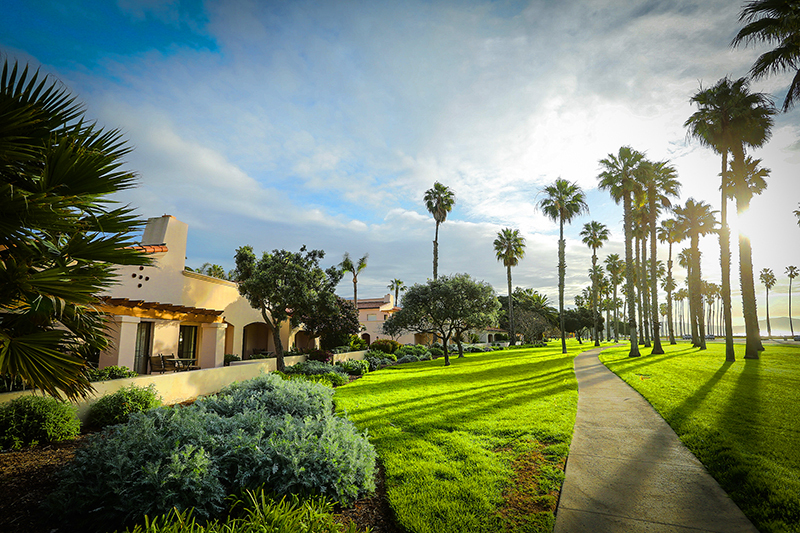 You should have no trouble finding a suitable hotel in Santa Barbara, although depending on the time of year availability could be an issue. Hotels in the area range from the original #1 Motel 6 (it’s been modernized) to five-star resorts and spas. The most popular places to stay, as ranked by TripAdvisor are Hotel Indigo Santa Barbara, Harbor House Inn, Simpson House Inn, Spanish Garden Inn, Pacific Crest Hotel, Cheshire Cat Inn, The Eagle Inn, Beach House Inn & Apartments, Marina Beach Motel, and Bath Street Inn. There are also numerous luxury resorts in the area. I stayed at the charming and historic Hotel Santa Barbara, a throwback to the early days of the city after being rebuilt following the 1925 earthquake. At that time, the hotel was a place to get away for movie stars such as Clark Gable and Carol Lombard. There was also a casino squirreled away inside and, as one might expect, booze flowed freely in the hotel during Prohibition. These days it doesn’t, since the hotel lacks a bar and dining room, although breakfast is served in the lobby. I didn’t find the lack of either an issue, however, since the hotel is quite close to several good restaurants. I found it quite comfortable and well located for sightseeing in Santa Barbara’s downtown area. You can get to Santa Barbara several different ways. If you’re flying you’ll arrive at Santa Barbara Municipal Airport (SBA), an 8-mile drive from downtown. There are daily non-stop flights from Los Angeles, San Francisco, Seattle, Portland, Denver, Phoenix and Dallas. If you’re driving, Santa Barbara is 92 miles from Los Angeles and 332 miles from San Francisco on California’s famous Highway 101. It’s also reachable by train (Amtrak), and is also a port of call on some coastal cruises. this makes me want to hop on a place to California and out of this snow storm! 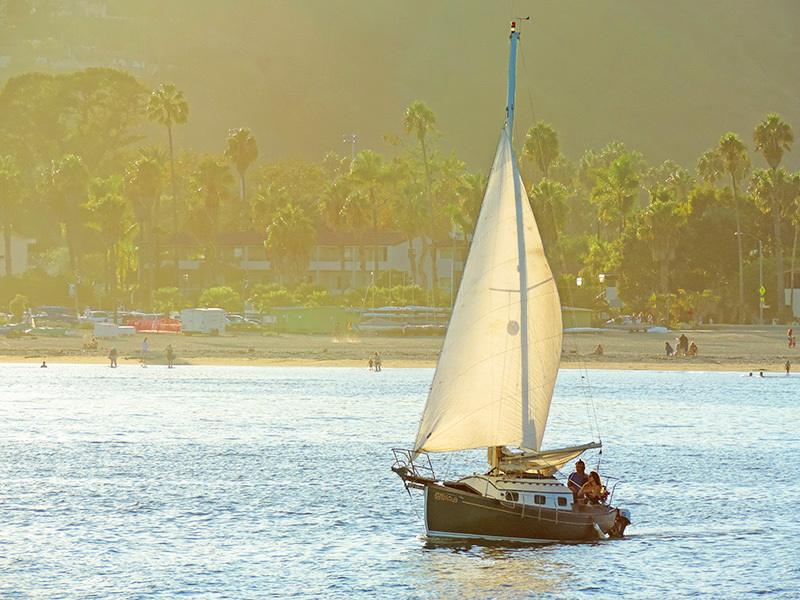 I’ve never had the chance to visit Santa Barbara before but this makes me want to add it to my bucket list! Add it to your list — you’ll love it! I visited Santa Barbara last year and I wish I had this information! The wineries, the museums, the historic architecture – you’ve done a wonderful job highlighting the city’s most beautiful sites. Thank you for sharing! I can see why Santa Barbara is on the list of all the celebrities! The place is so beautiful with the best of everything. Thank you for the great guide of the place. Hope to visit this part of the world sometime. If you visit California, SB is a great place to include! You had me at Santa Barbara wineries! I’ve not yet been when in the US, but you’ve definitely convinced me to visit. It looks so pretty there. Ah, the wineries! Yes, they are an integral part of the SB experience. A great combination of art, history and entertainment. Loved the way you have written this post – conscise yet with all the relevant information.